In the 80’s, I spent a week in the Auvergne, an area visited infrequently by Americans. I was there with Bob Noah who had arranged for a group of us to have private classes at the French National School of Pastry (Ecole Nationale Supérieure de Pâtisserie ) in Yssingeaux. This French departement and the area around Le-Puy-en-Velay intrigued me and I had always wanted to go back. I got my chance this past Fall. 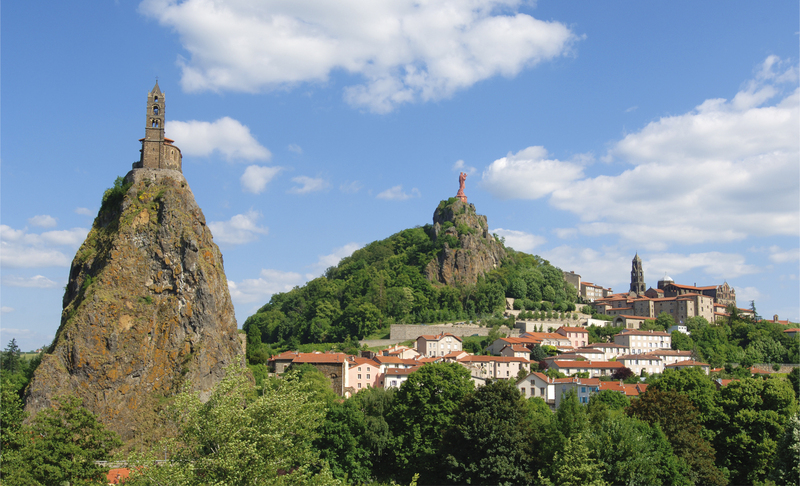 Not only is Le Puy known for being a stopover on the The Way of Saint James to Compostele (Chemin de Saint-Jacques de Compostelle), it is also well known for handmade lace, lentils, and these volcanic peaks. They seem to just shoot out of the landscape…. We parked our car and began the walk up to Cathédrale Notre-Dame-de-l’Annonciation, a stopover on the pilgrimage route to Santiago de Compostela in northwestern Spain. It was a climb and much steeper than it looks! I thought I was there! Nope, there are more steps inside the church….the view below is from the top inside the church…a very unique entrance. Local granite dominates the architecture…. Lace shops are abundant. I hope this is not a dying art. How does one keep track of all these pins and bobbins? And finally, something we all know about…the green Le Puy Lentils. Les Auvergnats call them ‘le caviar végétal’. Wash lentils in several changes of water. In a large saucepan, heat chosen fat and sauté onions, celery and carrots until tender. Add lentils, and then stock to cover by 1-2 inches. Bring to a simmer and cook for 20 – 30 minutes or tender. Drain if necessary. Serve with sausages…How about a Toulouse sausage? MJ dishes it out: No need to soak lentils, a good rinsing is all that is necessary. Be careful not to overcook. Do not add salt until the end. Too many people put these into the dried bean category and think they need to be cooked for hours. Lentils should be tender with a slight bite and you should be able to separate them with a fork….no mush! Looks great! New and improved. By the way, I don’t know who wrote that “canned “ description of touring with you and Xavier but he sounds like a clever fellow indeed! He is indeed a clever fellow!